 Memory can be as malleable as clay, warns a clinical psychologist, and the road to recovering memories of child abuse is strewn with the shards of ``unwitting'' errors by so-called expert therapists. Yapko (Trancework, not reviewed) bravely and horrifyingly suggests that accusations of child abuse are, at the moment, trendy. An expert on hypnosis with strong opinions on the subject of hidden or repressed memory, the author doesn't hold with the popular theory that those who can't remember childhood experiences must be repressing them, that repressed memories must be traumatic, and that trauma equals abuse--probably sexual abuse. ``Abuse happens,'' he mourns, ``but so do false accusations.'' Confronted with patients confused about whether they had been abused, and with seemingly innocent parents whose lives were disintegrating because their grown children had accused them of abuse, Yapko questioned nearly 900 therapists. What did they really know about memory and about recovering past experience under hypnosis? Not much, he found out. What led therapists to the diagnosis of childhood abuse? Commitment to their patients was often distorted by the therapists' training and personal beliefs: Certain groups of symptoms indicated child abuse whether the patient agreed or not, and resistance equalled ``denial.'' As a result, vulnerable patients were ``unwittingly'' (Yapko emphasizes) led to memories of abuse that may or may not have happened. Once an idea is planted, the mind then adds colorful detail, a process called ``confabulation.'' Dream interpretation--the ``astrology of psychotherapy,'' he calls it--helps fill in gaps. 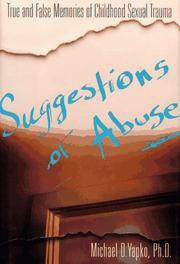 Yapko offers guidelines for accused parents, involved siblings, and abuse victims. Yapko gives no quarter to child abusers, but offers wise guidance and support to families whose lives have been decimated by false accusations.